Abydos is located West of the Nile, on the border between the valley and the desert, some 40 miles west of Dendera. As a burial ground of the ancient kings of Egypt, it became an important religious center from Predynastic times onward. It is particularly associated with Osiris, the "Lord of Abydos," whose mysteries were celebrated there annually. The ritual reenactment of Osiris' death and resurrection brought pilgrims from all over Egypt. The temple of Seti I at Abydos is a mortuary temple, although Seti himself was buried in the Valley of the Kings. Situating his cenotaph on the hallowed ground of Abydos enabled Seti to participate magically in the resurrection of Osiris "for ever and ever." 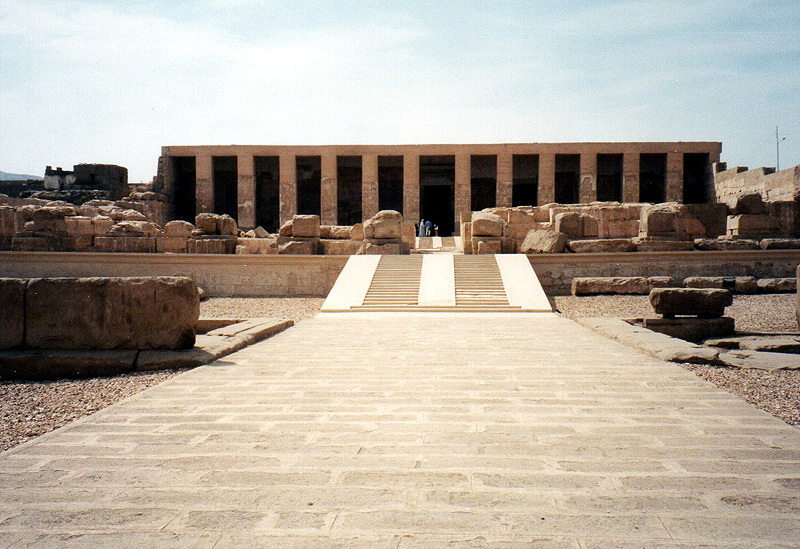 Seti's temple was completed by his son and successor Ramesses II. This gave Ramesses the opportunity to demonstrate his piety, and to carve his cartouches on yet another building. The temple facade, shown in this photograph, is heavily restored. The inner part, which includes chapels dedicated to Seti himself, Ptah, Re-Harakhty, Amun-Re, Osiris, Isis, and Horus, was completed during Seti's lifetime and is beautifully decorated in the fine relief carving that is typical of his reign. Some highlights from the decorated reliefs are provided on the following pages. For a comprehensive survey, see Temples of Abydos in 360°.